This photograph shows him wearing a navy blue wool Union Army frock coat and a black felt "Hardie Hat" (the dress uniform of an enlisted US Army soldier). 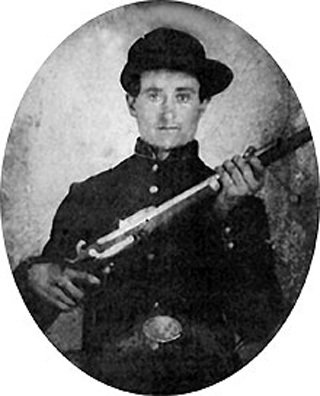 He is holding a .54 caliber Austrian musket, the weapon initially issued to the 80th Indiana. It is believed he has this 'image' taken circa September 1862. An electronic copy of the original image, and written permission to post it on the 80th Indiana website, were provided courtesy of his Great Great Niece Belinda Wiggington. Hezekiah Blevens was a 19 year old "Farmer" residing at Edwardsport in Knox County, Indiana when he volunteered and was enlisted by Captain James L. Culbertson on August 15, 1862 into what became Company C of the 80th Indiana. Hezekiah was mustered into the Union Army at the rank of Private for a 3 year term of service on September 3, 1862 at Camp Gibson near the town of Princeton in Gibson County, Indiana. At that time the Army noted he had been born in Indiana and was "5 feet 8 inches" tall with "grey" eyes, "dark" hair and a "light" complexion. Pvt. Blevens died of "disease" at Marietta in Cobb County, Georgia on June 20, 1864. For more information about this soldier, view his Profile by clicking HERE. All Rights Reserved. Created November 21, 2004. Last updated December 2, 2004.